… but just for a night. But one night is better than no nights, then, isn't it? I will admit to being a rather giddy fan of Jack. During the 80s, the 90s, and the double-aughts, as he defined political humor for The Oregonian, I became a fan. Impossible not to, as far as I'm concerned. His wit, so dry as to make the planet Arrakis seem a rainforest, and an unmistakable drawing style were first-class to me, and I was smugly proud that, being The O's cartoonist, he was ours. I've been a fan of the editorial cartoonist in general since I was a little kid who was one of the few I knew who could pronounce the word Watergate. I've been a political news-obsessive for that long. All of my favorites, I found, served their wit on wry; Toles, Danziger, MacNelly, Oliphant, Herblock. An acid wit was a must for me. Still is. When me and a lot of local Ohmanites found out, just about two years ago this month, that Jack had decided to leave The Oregonian, devastated … well, that word will have to do, though it be somehow inadequate. Tear out our hearts, why don't ya, Oregonian? Well, that was then; this is now. Jack's gone on to the Sacramento Bee, and has cut an amazingly funny (and aptly trenchant) figure; anyone who can make Rich "Governor Goodhair" Perry cry is just my kind of cartoonist. The drawings remain as crisp and funny as ever, though now focussed on California politics, and this isn't a bad thing, really … I can't remember having this much fun following lower-left coast politics. 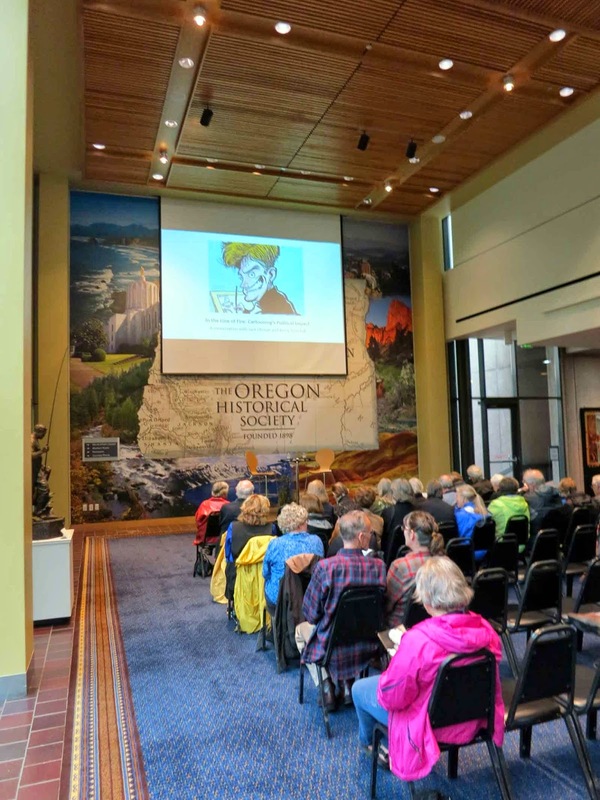 When I heard that he was coming back to Portland to do a talk on political cartooning, I was hooked; when I found out it was free, I was netted and boated; when I hit the World Affairs Council of Oregon's website and found that I was early enough to nab a couple of seats, I was served for dinner. The conditions of Monday were covered in the previous missive; I shant retread that path, trompe l'oeil or no. 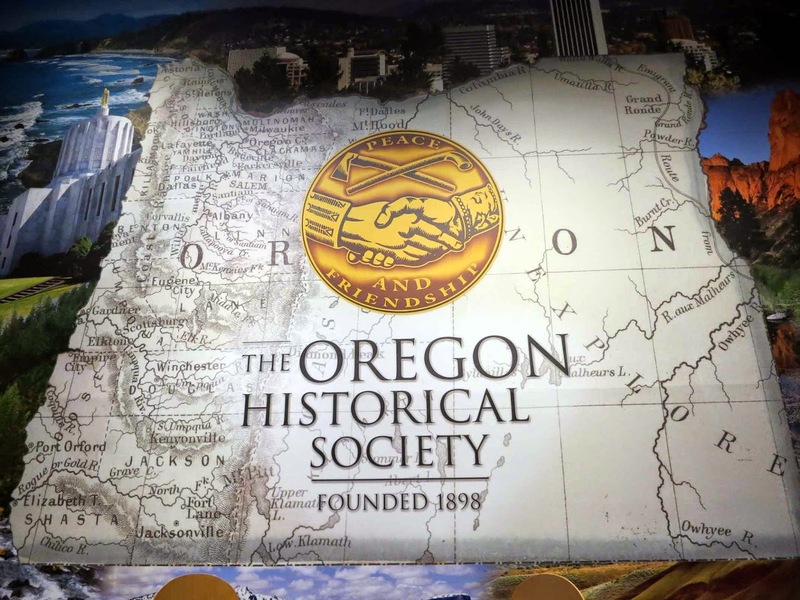 I will make the short, shameful admission that I've never, unto now, have visited the Oregon Historical Society, and it's shameful because my taxes make it so that, as a Multomah County resident, I can visit for free. I should know better than this. Tickets were unnecessary; all that was required was to check in at the door. We entered the spacious atrium area and was able to get a seat up at the front. The casualness of the crowd could belie the importance of some of the people that were there that night. But a bit more on that presently. Jack recognized me in the front row and shot me a friendly hello; I returned thumbs up. I am fortunate to have his friendly custom on FB, and that's how he recognized me. If anyone remembers how sharp and witty the humor in his cartoons were, I can tell you that Jack's one of those rare people who come off in reality as advertised virtually. Warm, generous of spirit, and funny as hell. On the left, OHS director Kerry Tymchuk. 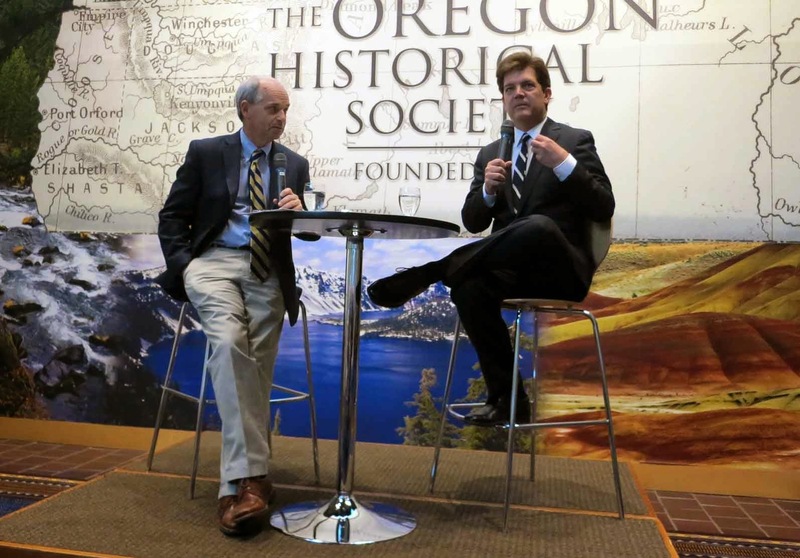 On the right, Jack Ohman. 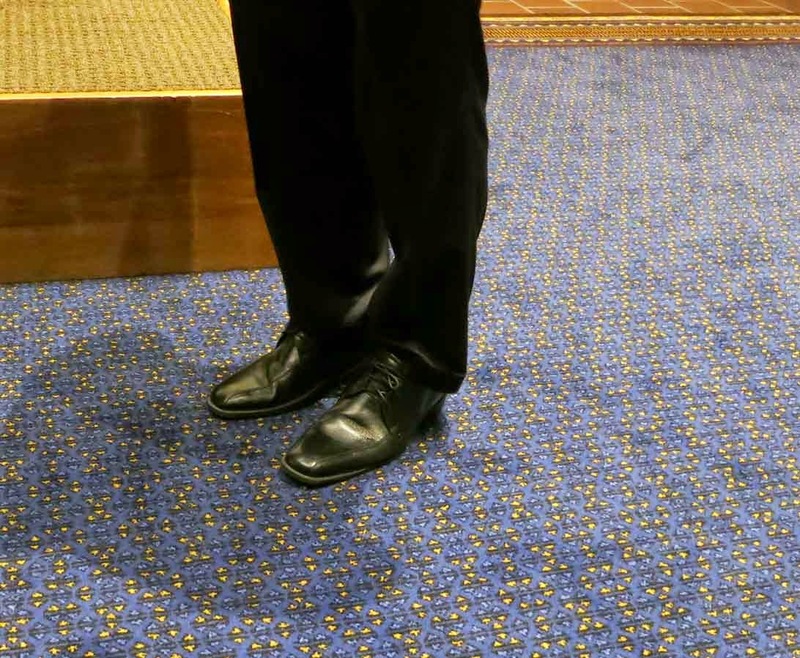 Somehow I got a photo of his shoes. The talk began right on time, and OHS's Kerry Tymchuk did the wisest thing in letting Jack roll about his times here in Oregon. You may have heard Jack was smart; I had an inkling, reading his cartoons and writings through his Oregonian years. Forgive me the obvious joke, but I didn't know Jack; the man is an encyclopedia of mid-to-late 20th Century lore on everything Oregon Politics from the legendary Senator Wayne Morse forward, and I suppose it stands to reason. Uncurious people do not make good or memorable political cartoonists. Sharp wits collect the best stories. And now, I have more reading to do. I found it funny, though it stands certainly to reason, that politicians who get japed at by political cartoonists want the originals, even if the portrayal isn't always that complimentary. It's a little like "Wierd Al" Yankovic in a way … you know you've arrived if Jack makes fun of you in the paper. It's a sign you've arrived. I remember a certain Ohman cartoon which showed Lon Mabon losing it over two men grasping hands in a certain way, and the man who was with the Mabon character telling him to relax, it was only a secret fraternal handshake. I find myself wondering if Mabon ever asked for that original … I'm betting no. Lon Mabon didn't strike me as a man with much humor in him. The field of political cartooning is nowhere near what it once was, with the national supply going, sadly, down. According to what I heard, not only did a lot of smaller-market dailies have political cartoonists, but the bigger ones had two or even three (when Jack started out, at age 19, at The Columbus Dispatch and later at the Detroit Free Press, if I heard correctly, he was in one of those arrangements). I still feel a deep loss that The Oregonian wouldn't hang on to Jack, but as far as the role he's playing at the Sacramento Bee, where I still follow his work, I'm thrilled that some actual-news-7-day-delivery-paper has the good sense to support him. The talk was capped by Jack talking about various cartoons and cartoonists and their impact on their subjects. This was where I heard the story about subjects wanting the originals, and we all got to chat and shake hands. Jack, I found was a very encouraging presence. A woman who wondered to me how someone would get a start at editorial cartooning, who was asking on behalf of her kid, was treated as a new friend; I stood for a few minutes next to Norma Paulus, who was almost Oregon's governor circa 1986, and was momentarily within about an arm's length of David Sarasohn, who still writes pretty much the best opinion articles The Oregonian publishes, which crackle with dry wit and great style. I did shake Sarasohn's hand and just thanked him for being who he was, which I think is a necessary thing, especially these days. and yes, I'm a giddy fan, so there's me for you. I don't know what its like for other people who meet people like this who are nationally acclaimed and that one really sincerely admires. But the few minutes I spent near Jack made me feel like a friend. This was a big experience for me, and I'm thankful. Jack, as you can see, did me the ultimate benediction sketching me an quick-self-portrait in my diary (yes, this is my diary. Not even my wife has seen the inside of it but Jack has). It's in volume 19, which happens to also be my favorite number, but now I'll be able to find it, too. 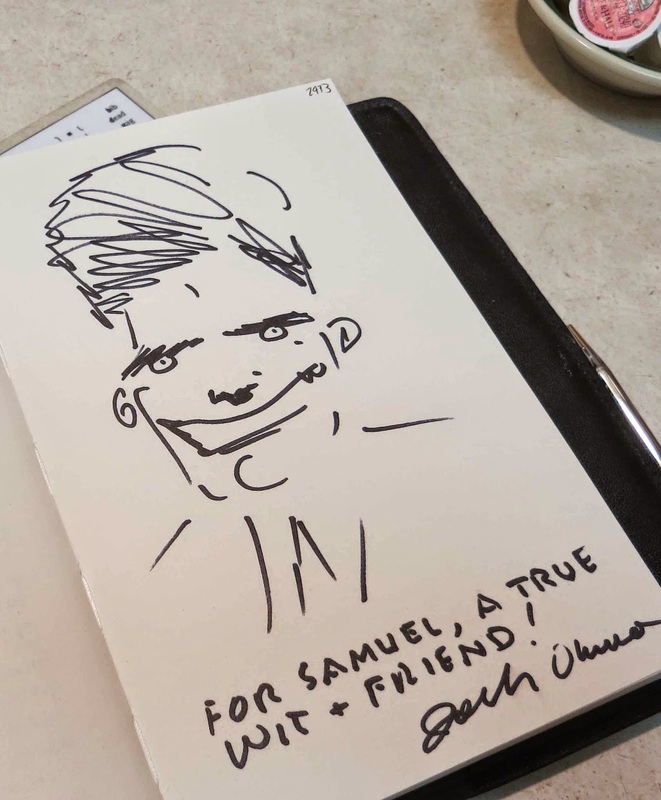 And, you know, I don't usually let people see the inside of my diary, but when I do, it's because a remarkably inspiring friend has made a sketch there. Thanks for hitting Portland again, Jack, and thanks for being a friend.